The events in New York have had a serious knock-on effect on the entertainment industry. While several high-profile action films, such as Arnold Schwarzenegger's "Collateral Damage" (about a man whose wife and daughter are killed in a bomb blast) have had their releases pushed back, other films are going back to the drawing board. "Men in Black 2", which is already shooting, has to be rewritten. 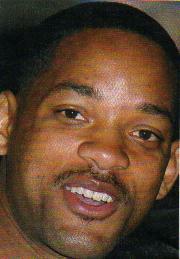 The film, again starring Will Smith (see picture), was due to climax at the World Trade Centre. Similarly, Jackie Chan's film "Nosebleed" has to be totally reworked. His character was supposed to be a window cleaner at the WTC who hears of a terrorist plot to blow up the Statue Of Liberty. Meanwhile, Ben Affleck's film "The Sum Of All Fears", about an Arab terrorist plot to blow up the Superbowl, has been shelved. The move will prove hugely expensive for the studios but right now that's the last thing on people's minds. Waarom moet de film "Men in Black" herschreven worden? Vanwege de terroristische aanslage op het World Trade Centre in New York van 11 september 2001. Omdat de film te duur bleek te zijn.